→Why you should buy a soymilk maker? Why you should buy a soymilk maker? Vegetarianism and veganism has grown popular in recent years, mainly because of the high incidence of high blood pressure, stroke, diabetes and other so-called “lifestyle” diseases worldwide. Veganism is the rejection of the use of animal products for any purpose, and from the diet. It means “non-dairy vegetarian” and lives with the doctrine of non-exploitation of animals. This shift of a growing number of people to vegetable products resulted in the popularity of soy and grain based food products. Soy milk is now the most popular substitute for milk as it provides almost the same nutritional value as cow’s milk that a human body requires in terms of protein and carbohydrates, and other vitamins and minerals. Before soy milk makers became widely available in the market, some people were already making soy milk at home using laborious methods: soaking beans for hours, grinding the soy beans, straining the ground beans, and cooking it. 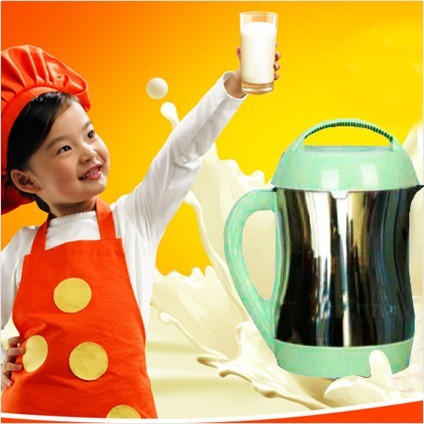 The soy milk maker makes the task automatic and fast, saving users money and time. Those who are very particular about their food and want to make sure they are only consuming vegetable-based food uncontaminated with any animal-based ingredients are assured if they make the soy milk themselves. Soy milk made at home can be flavored with a choice of flavorings, sweetened with sugar, other sweeteners or salt may be added. It can also be thickened according to the consumer’s preference. A soy milk maker will be a great addition to any kitchen especially for people who are allergic to cow’s milk or who suffer from lactose intolerance. The presence of a soy milk maker in the counter will cause people in the home to make soy milk regularly and get the various health benefits from this beverage. Besides the fiber in soymilk, they contain isoflavones which are credited with the prevention of heart disease, osteoporosis and cancer. The powerful anti oxidants in soy milk help in fighting diseases and aging. Getting a daily dose of soy milk is an easy way to the enjoyment of good health. It is rich and creamy with a nutty sweet flavor. Soy milk can be incorporated into dishes and used in several ways, making people enjoy the benefits and feel of a dairy-like beverage without the cholesterol, fat and sodium of cow’s milk. A good soy milk maker will also be able to make healthy rice milk, oat milk, almond milk and bean milk, and will make the homeowner save a lot of money from his grocery bill. As the new machines are fully automatic, it will not be difficult to operate it even for people unfamiliar with machines and gadgets. The soy milk maker will enable the owner to make organic, delicious soymilk in a few minutes and the beverage will always be freshly made. Buying a good soy milk maker will enable consumers to reduce expenses while improving the nutritional composition of their daily food consumption. It becomes so easy to incorporate good nutrition from organic milks into the household diet for a very low cost with a soy milk maker in the home as soybeans and water is much cheaper than commercial soy milk or dairy. The benefits are three-fold: savings on grocery bill, good nutrition and disease prevention.